I spent the last week with my friends from the Adidas Adventure Team in the Julien Alps in Slovenia. The Adidas Adventure Team consists of four worldclass outdoor athletes: Schorschi Schauf (Kayak), Beat Kammerlander (Climbing), Mike Küng (Paraglider) and myself. Unlike the “Hans Rey Adventure Team” trips, this trip was more like a training camp, get-together, and a film/photoshoot opportunity. Adidas went much out of their way to organize this trip for us and to make it something special. They got us a big house in the village of Bovec, where we had our headquarters with our own cook and masseuse. A seven man filmcrew was present as well as a professional photographer, everyone of us had the chance to spend some quality time shooting their sports and checking out the other athletes performing their sports. When I first got there I was blown away by the beautiful countryside and mountains. I had no idea that the Alps extended all the way into Slovenia. On the second day we drove up Mangart Mountain (2400m) to check out Mike’s acrobatic paragliding skills. That guy is crazy – at one point he landed on my back – while I was bombing down a hill on my mountain bike…. 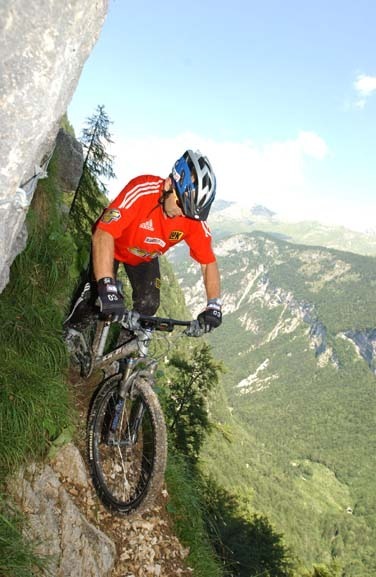 I rode some killer trails – one of them was like a razoredge ridge with gorgeous views and a deadly drop on either side. The highlight was a giant spree field, super steep with loose rocks – it was like riding on bearings. The next day I did a nice road bike ride on my new GT ZR1.0 to check out the area for more filming locations. On Wednesday I got to check out the finesse and skills of Beat. He is world renowned rock and ice climber and has many first ascents to his name. 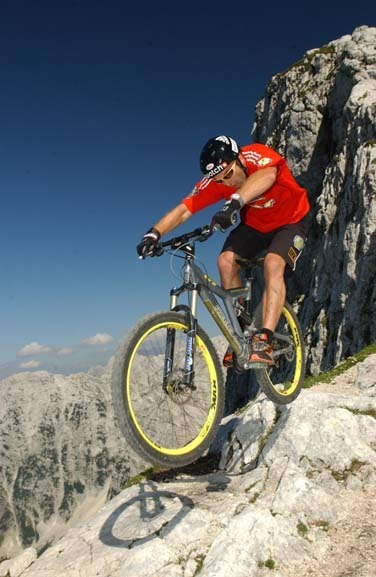 Rockclimbing is a lot like trials biking – it takes a lot of technique as well as mental and physical strength. Thursday was kayak day and luckily for Schorschi it had rained all night long; both, the water as well as Schorschi were raging. I found some killer trials area with big boulders right next to the raging river. We did some fun action shots with the two of us. I had a blast riding my 20inch trials bike. The highlight was a synchronized drop-in from 15 feet info turquoise water. The big surprise was on Friday, when our Team Manager took us canyoning. It’s a blast to work your way down a river: climbing, repelling, jumping, swimming and sliding. The most fun are the natural slides, which are almost vertical. In one case we slide 45 feet into a pool. Definately an awesome adrenaline rush. It was a great week and it was very cool to get to know each other andall the different sports. Mike took me on a tandem paraglide flight – including loopings and spirals – that made me dizzier than any rollercoaster. We got some awesome footage – which will be available free of charge for any editorial use. Please feel free to contact me to get a photo CD or some beta tape footage. Special thanks to Axel Burkhardt and his crew for making this happen. Forever Sports! Hans and The Adidas Adventure Team on Tour in Slovenia.